One of a Kind! Custom built block style home with custom details throughout. Exposed and large windows in most rooms. Gorgeous flooring includes tile floors and custom cut wood throughout. Two suites both with private decks on the second floor with full baths and steam showers. Additional office or bedroom on main floor with a powder room and large infinity pool view from both living room and dining area plus Viking Stainless appliances built in to Cristobal cabinets matching the doors which are fitted with HAGAR stainless hinges. Custom pool and spa with tile trim. There is an outside half bath and outdoor shower. Large architecturally designed outdoor bar and BBQ area. Large entrance porch with imported custom front door. All this is protected by a central security system monitored camera. Fully furnished 5 split system air conditioner's. Private well water plus community water. Large back yard with Papaya, Avocado, pineapple and other fruit trees. 14 mt X 7 mt. infinity tile with coral walkway pool with Rancho with sink, outside shower bathroom and fish cleaning station Maid or Gardner apartment below over sized 2 car garage, with large water storage tank. Existing space for 3 or 4 bedroom bed and breakfast structure or additional garage. 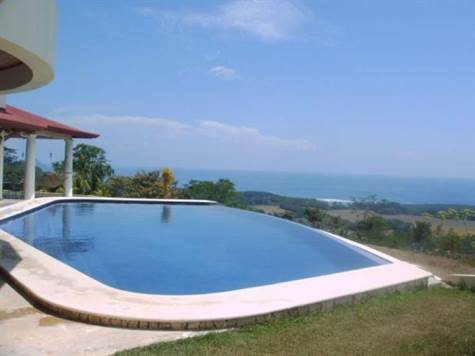 This is one of the best built homes in Hatillo. Not to be missed!